“This is the perfect day to go fishing,” said Gilbert. 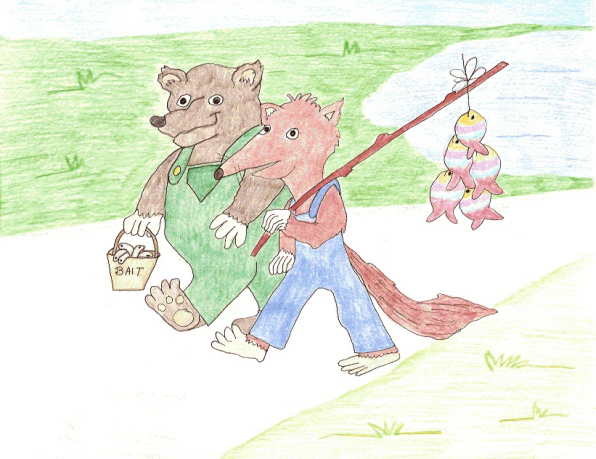 “The sun is out, but it's not too hot and there's a gentle breeze.” The bear picked up his fishing pole and headed for the lake. On his way there he remembered something. “Oh no! I don't have any works for bait. How can I catch a fish without worms.” He sat down in the grass at the side of the road and thought about his problem. “What a great day for fishing! I've been wanting trout for days.” Sidney picked up his bucket of worms and headed down to the lake. He was halfway there when he remembered something. “Oh no! I don't have a fishing pole. How can I catch a fish without a pole?” He sat down in the grass at the side of the road and thought about his problem. They both sat in silence for a few minutes. Gilbert's eyes lit up. Sidney's eyes did too. “Gilbert, I've got some worms,” Sidney said, grinning. “Why don't we share? We can take turns using the pole and sharing the worms. That way both of us will get some fish to eat tonight.”Sidney stood and pulled Gilbert to his feet. They headed to the lake and caught a lot of fish. That night they feasted together on rainbow trout. “Thanks for sharing your pole,” Sidney said. “Thanks for sharing your worms,” Gilbert said and the two of them headed for their homes, happy and very full of fried fish.